In 2015 I spent £24,413 and in 2016 I spent £27,001. 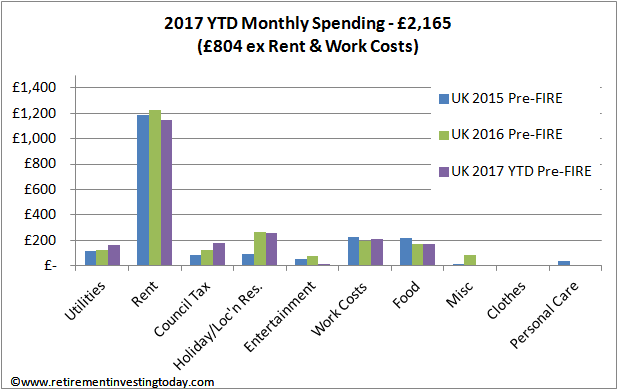 If I did nothing 2017 could be around £26,000 but FIRE is coming (could come?) this year so my spending profile will (could?) transition from pre to post-FIRE so that’s not bankable. The other advantage of tracking spending like this is that you start to understand what your personal inflation is actually looking like which allows you to take action if it’s starting to get out of hand. It’s no good going into FIRE with a planned spending of £20,000 per annum, which you then plan to increase with published inflation, only to find you’re actually spending £25,000, which is then increasing at a rate greater than inflation. That’s a road to potentially running out of wealth before you run out of life. So how does my personal inflation look? In 2016 my personal inflation was 10.6%. That was much higher than the readily published CPI at 1.9% and RPI at 2.6%. In 2017, if I do nothing, I’m on track for a personal inflation rate of -3.8% while CPI is running at 2.3% and RPI at 3.1%. So why the big swings I hear you ask? My Landlord started to play silly games with a big rent increase in 2016. As in previous years I tried to moderate the increase but this time he wasn’t having it. I sucked it up knowing that it was only 12 months or so to FIRE but then he decided he was going to sell the place and expected me to help with the viewings. Time to move on. 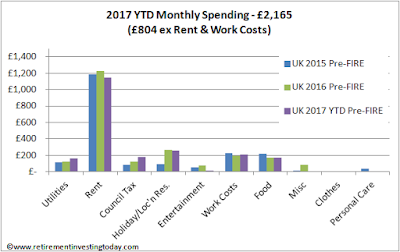 My new flat is larger, in a nicer neighbourhood, walkable to some beautiful green spaces while my rent plus Council Tax is 1.4% less per month in 2017 than 2016. In 2015 my food spend started to look excessive at £218 per month. I took action by using the lowest price grocery shop technique I detail in my book and was able to reduce 2016 spend by 21.4%. 2017 is looking like a modest 0.4% increase in comparison. I also continue to use my Save More method to keep my personal inflation in check. Overall I’m pretty satisfied with how I’m keep spending costs in control while seeing my quality of life continually improving. It’s also not a very arduous thing to keep track of it, taking me just a few minutes per week to capture the numbers. Do you know your personal inflation? Are you holding it in check? I'm not sure you can easily track expenditure and its inflation over such a large change as retirement, moving house and country. Beforehand season tickets and sandwiches loom large, afterwards it might be golf or international hotels, and in the interim its all stamp duty. I intend to track it pre and post to understand how it varies. I do agree the profile will be very different though. Of course between the two, as you also highlight, I also expect some one off not insignificant costs to appear - removals, stamp duties, temporary accommodation, visas etc. 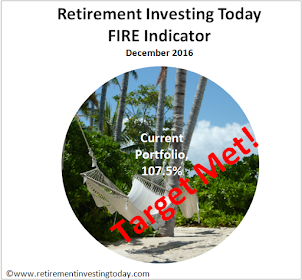 With around 60% of my portfolio invested in equities, I am hoping my returns/income will at least keep pace with or even exceed inflation. I'm currently only 45% equities as I still have a large cash boat anchor dragging behind - the cash for my eventual home purchase. Hope you sorted out your PC and managed to recover your data? Never thought about personal inflation but trying to hold on costs! Great article! For those that do track expenses what you notice is the large variance in month by month numbers. When you compute annual inflation I don't think your actually measuring inflation. You're actually just demonstrating this variance over a longer time frame. 12 months isn't enough to smooth it out. Your inflation is in there for sure, but it's obscured by the variance. This is less true for some individual categories like groceries. How many mouthes are you feeding on those groceries numbers? - how many weekends in the month as this indicates the number of food shops and car petrol tank fills that occur. - aircraft and accommodation bookings for holiday/location research. I actually have very few one off large annual costs. haha - thats because you don't own a house - you wait..
Yeh, on balance, having owned and rented, I wouldn't want to go back to rented. Theres something satisfying about fixing up your own place. for 4 are you living on stale bread and water? One of the family also has some pretty specific dietary requirements which adds a bit of cost. Generally, I'm pretty happy with the amount we spend on food as we eat very well. "Do you know your personal inflation?" No, and if I thought I needed to know it I'd conclude that we were living too high on the hog. I suppose that if our capital started to shrink I'd need to start analysing expenditure. But we can see ahead to the start of a new income stream, and further ahead to ceasing to save for a particular project, so everything is hunky-dory at the moment. We're pretty frugal on the whole. It's more than that though. It's a healthy reality check every month that you have your financial life in control. Lifestyle creep is something I see around me everywhere and I could imagine it being something that's very easy to slip into. It's the classic Quality of Life vs Standard of Living battle and I want Quality of Life to win. At what withdrawal rate is that vicarage? Its complicated. I don't model a withdrawl rate, I model a dividend rate and capital gain rate, am bullish about p2p and include a state and civil service pension as well as SIPP and ISA. But I'm starting with more than you and am 5 years older. I think it depends how tight your numbers are and whether you are really prepared to invest the time and effort to do it. For the big ticket items (like rent etc.) clearly it makes sense but I am not going to worry too much about things like the price of milk (although I do tend anyway to buying such items at Aldi). 1. Is the buffer in overall spend that my projections assume i.e. if I were to take a 4% withdrawal rate then that delivers a 30% buffer over my expected spending. 2. The second point is the ratio of investment returns to inflation which I currently have as a net zero i.e. I assume no real return on my assets. Very cautious. Finally I have a significant cash buffer to shield from market volatility which means I don't need to touch my investments for at least 5 years. I sweat the small stuff, as well as the big stuff, as I've found that it can get away from you if you're not careful. On various forums I've been challenged on the 'Latte Factor' but for me it's there, it's not insignificant and so I include it. It sounds like your criteria is pretty conservative though so can maybe understand. Assuming no real portfolio growth forever... If that occurs for the next 40 years the world is going to get very interesting. I'm also going for a cash buffer but for me I think 3 years is a good target. I reckon we spend £500 per month on groceries ( 2 kids) and my wife prides herself on knowing the best bargains at Aldi. Lidl and B&M! Did you really spend nothing on clothing for the entire family in 3 years or is that just on yourself? 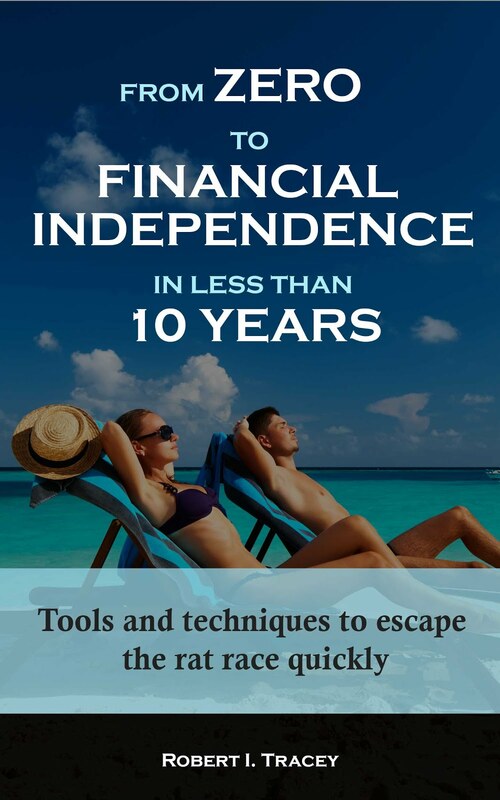 Will you lessen the frugality once into FIRE in the Med or look to spend about the same? The rule in the RIT household is that I cover all family costs as well as family 'fun' which is what you see here. Mrs RIT only covers her 'fun'. She doesn't earn as much as me and started later so is also trying to quickly build wealth to cover her FIRE 'fun' costs. We want to FIRE together. Re clothes. Excluding (as clothes count as 'fun' in this household) Mrs RIT in 2015 £29 was spent, in 2016 £0 and in 2017 £0 (so far). We've found provided clothes are clean and freshly pressed our quality of life needs are fulfilled in this area. I don't think we'll change our 'frugality' in FIRE as I don't think our quality of life will improve with more stuff. If spending more would improve it I'd be spending it now. What we're chasing is time which will enable a lot more exercise, cycling, swimming, hiking etc. I have to admit that I could only tell you my/family's personal inflation from 2007-2013 when we were tracking expenditure pretty much to the penny. I've now started tracking again from start of 2017. Personally (no pun intended) I'd focus more on the relationship between personal inflation and general price inflation. I think if we get a period of high (general) inflation it will be difficult to keep personal costs down...and that weighs heavily on my withdrawal rate. Btw, RIT on that subject is your email just retirementinvesting... or do I need to the contact. bit?.. sent something on withdrawal rates to the former but think may need the prefix too. Many thanks for the valued book feedback. Once I FIRE I'll be writing a 2nd Edition as I'll want to include the RE experience as well as the FI. I'll be sure to also include the valid suggestions you make (plus I have plenty more from others). I won't do that now as I found writing the book and working a very full time job in parallel was tough. Next time I want it to be far more enjoyable. I did it the first time as my FI experience has been so positive that I just wanted to share it as far as possible as quickly possible. I'm glad I did as well as it's currently number 4 on Amazon's Retirement Planning rankings so it's helping to get the message out.